The Rail Trail Advisory Committee works with all stakeholders to ensure best practices are used. Events along the G2G Rail Trail help you enjoy, support and maintain this diverse and high quality trail. Find maps of the G2G Rail Trail as well as nearby trails in the same communities. Show your love! Find your best way to keep the G2G Rail Trail a vibrant part of our local landscapes. This is not an organized ride with a start and finish time. Ride when & where your comfortable on the trail! Tag your friends and cycling clubs. Be a lead rider or join a group of others. G2G is an open free trail that is maintained so we like to see groups get out and ride. Looking for a winter challenge? Grab your friends and get out on a fun afternoon of fat bike riding the G2G Rail Trail Experience. Organize amongst your groups/friends and choose the location where you want to start. G2G Rail Trail has 5 suggested locations to meet up, but you could start in any community along the trail. Challenge other riding groups to meet out on the trail, socialize and share your favorite tips on how to maintain your bike in the winter months. Get you favourite Bike Shop out and supporting the G2G Rail Trail Experience! Make a donation of $25 or more towards G2G for the Fat Bike Challenge and you could win a stay at LUX Hotel in Blyth value of $300. To enter the contest go to: https://g2grailtrail.com/donate/ Under the ‘Fund’ drop down select: Fat Bike Challenge and make a $25+ donation. One night stay in the Greenway Room at LUX Hotel in Blyth themed after the North Huron Greenway Trail. Owners Colleen and Shane have just opened Hotel Lux in Blyth. The hotel has 3 rooms that are designed with BLYTH’s rich history in mind. One of the rooms is named Greenway Room for the part of the G2G Rail Trail Experience that goes through Blyth. Included in your 1-night stay is a bottle of local wine. The package has a $300 value and your stay must be arranged for 2019. It’s a new year and G2G is looking forward to seeing our supporters out on the trail. In 2019 G2G Rail Trail Inc. is moving ahead with plans to complete the G2G Rail Trail Experience with the installation of the larger bridges and needs financial support for the $100,000+ need to fulfill the project management budget. Don’t let the colder winter weather scare you. Get your bike out and come join the family-friendly G2G Fat Bike Challenge. Charitable receipts issued upon request. The Goderich to Guelph Rail Trail, which has become known as G2G, runs 127 km along the former CPR railway line, which stretches from downtown Guelph to the waters of Lake Huron. It is overseen and maintained by volunteers and steward groups who are passionate trail enthusiasts. Working from the original plan that was drafted over 25 years ago, the G2G Rail Trail volunteer based advisory committee stepped up, roughly five years ago, to adopt the responsibility of completing the proposed rail trail. The G2G Rail Trial Advisory Committee leads working groups along with the existing established trail groups. The central purpose and goal of the committee is to foster a final operational plan for future maintenance and trail development using all best practices and resources available. The Kissing Bridge Trailway is the 45 km section of the G2G that runs between Guelph and Millbank and is overseen by the Kissing Bridge Trailway Advisory Board. The Kissing Bridge Trailway travels through rural communities, rivers, and wetlands of Southern Ontario. While on the Kissing Bridge Trailway, you are able to take a 2 km detour to view the West Montrose Kissing Bridge, the last covered bridge in Ontario. The Trailway offers a unique view of the surrounding farmland and extends into Mennonite county. The surface of the trail is mainly composed of stone chip and is extremely flat and even due to the fact that it runs along a former railway. This makes the trail suitable for many activities, including Hiking, Biking, Running, and Walking. Passing by rich southwestern Ontario farmland, the Perth Huron Pathway runs from Millbank to the outskirts of Monkton via Milverton. Not far from the PHP the neighbouring Avon trail can take you back to Waterloo Region on a fresh route towards Conestogo. The western end of the G2G Rail Trail begins in Walton and ends at the shores of beautiful Lake Huron in Goderich, Ontario. Running primarily through Carolinian forest and agricultural lands, the LHR encompasses the Goderich to Auburn Rail Trail (GAR) that is supported by the Maitland Trail Association -from Auburn to Hwy 21 in Goderich – and the Menesetung Bridge Association – from Hwy 21 to the lake. Not to be missed on this route is the historic Tiger Dunlop tomb and the breathtaking view from the Menesetung Bridge that spans the Maitland River and looks out onto Lake Huron. Get off the couch and on the TRAIL! All of our events are supported by the surrounding communities along the G2G Rail Trail. As an outdoor enthusiast, you, your friends and your family can Bike, Hike, Run or Walk the trail. From bird watchers to experienced cyclists, the G2G Rail Trail offers a place for you to be as active as you choose. The key focus the G2G Event Committee is to encourage local communities to engage with the trailway, while allowing for a safe environment for all ages. Watch our webpage calendar, Facebook and Twitter feeds for information on upcoming events. For the past 6 years, thousands of outdoor enthusiasts have supported, using human power, the development and conversion of the Goderich to Guelph Rail Trail. Spring On The Trail on May 13th is our major fundraiser of the year. In 2017 it will be at both ends of the trail with events along the Kissing Bridge Traiway that runs from Guelph to Millbank and on the G2G Trail in Goderich and in Blyth. 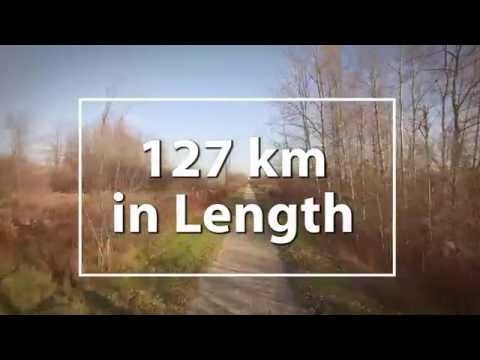 Help facilitate the community based conversion of the former CPR 127KM rail bed by coming out to support, enjoy and utilize the trail. Look for events and information hosted by volunteers in any of the communities along the trail. For location of “trailhead” crossings, follow the trail on our google map link. Spring On The Trail is a free event – but we do ask that you consider a contribution of $20.00 or make a larger donation towards trail improvements. Go to www.springonthetrail.ca for more information. You can donate by clicking our Donate button or follow any of the Paypal links. You can volunteer and participate as a group, club or business by clicking HERE to go to the SOTT event page. We love to share our trail! While most happenings on the trail are spontaneous or are personal treks, larger activities are welcome and encouraged. Plan an event along the trail and let us know, we will post it for you to help pass the word. Past years have seen enthusiastic use of the trail for the Steaming Nostril bike race and of course our own Spring on the Trail. We look forward to working with you on your event. This Canada Day long weekend, prepare to join other intermediate to experienced bike riders from across Ontario and beyond for an epic 4 day, 3 night challenge tour of the G2G Rail Trail! Supported camping tour rides the G2G Rail Trail from end to end and back across rural Huron, Perth, Waterloo and Wellington. Bike your choice of between 200km and 270km total over 4 days, mostly off the roads on the G2G Rail Trail with a few on-road detours as needed. Enjoy stopping for food and drinks at rural favourites like Anna Mae’s in Millbank for baking and broasted chicken, or the popular new Cowbell Brewing Co. in Blyth. Take in wide open country landscapes from your bike and sights like the covered bridge at West Montrose. Camp with showers and facilities overnight Friday in West Montrose, then camp two nights in Blyth. Ride Canada Day to Lake Huron and the beach at Goderich, or stay back and enjoy the day in Blyth at local restaurants, the brewery and the theatre. Cycle back on the holiday Monday to the finish line in Elmira in the company of friends from the tour. Riders get camping, showers, luggage transfers, meals, daily tour cue sheets, volunteer support riders, SAG vehicle support, water/snack/rest/community stops and more included in their registration fee of $375 (all taxes and registration fees included). Stops in the community – Multiple places on route to stop and refuel, provided by local contributors. EMS – local emergency services will be notified of route and will be available should there be a need. Parking – At beginning of trail, to keep vehicle till return. Staff and volunteers – Tour Director, operational volunteers needed, planning Committee Volunteers needed. Luggage: Tour participants can bring a hockey bag, including camping equipment, that weighs up to 40 pounds and a second smaller duffel bag for personal items. No hard sided suitcases, boxes, cases, coolers or loose items like lawn chairs. Label everything with your name. Nothing fragile, perishable or breakable–luggage transportation is at your own risk. You carry your baggage from the luggage truck each day and help unload the truck too, so lighter is better. Also waterproof everything with dry bags or plastic bags–the luggage truck gets unloaded rain or shine and your gear may be rained on. Camping: Hockey bag, tent (don’t forget the tent pegs! ), sleeping bag and foam/inflatable pad, pillow, sunglasses, earplugs, . Personal items: Towels (beach and shower), sunscreen, toothbrush, soap, shampoo, deodorant, mirror and toilet paper (just in case). Some riders also bring and use chamois creme–your choice. Apres-Ride Clothing: t-shirts, shorts, long sleeved shirts and long pants (in case of bugs in the evening), rain jacket, hat, regular shoes, socks, beach sandals, swimsuit. Bike Clothing: Bike Helmet (mandatory! ), bike gloves, cycling shorts, bike jerseys, rain jacket and rain gear (ride goes on if it rains). Other Bike Equipment (bring on the ride with you each day): Bike lock (must have), bell (must use to warn other trail users), water bottles, personal snacks and energy drink mix, bike repair kit (spare tube, tire levers, and portable pump). A rear view mirror and bike lights may be helpful. Be sure to store it all in waterproof bags. The 2018 Ride is geared toward the intermediate to experienced cyclist. Good physical preparation and conditioning will make the ride much more fun. The ride will cover approximately 240 to 270 km in four days with daily distances ranging from 30 to 90 kilometers. This is not a race! While the trail itself has a maximum grade of 3 degrees and an average grade of 0 degrees, trail surface conditions and weather can make the ride very strenuous. All riders are expected to ride the full distance each day except for emergencies. Before the ride begins, ride as much as possible and ride as often as your schedule allows. Longer rides of 50+ kilometers are important, as are back to back rides on consecutive days. You should experience cycling in all types of weather and on similar surface terrain as the G2G Rail Trail. Summer weather in southwestern Ontario is unpredictable. It may be hot (over 30 degrees C or 90 degree F), humid, windy, rainy or cool at night. Weather conditions can make even the shortest days more challenging. The surface of the G2G Rail Trail varies from well groomed, packed crushed limestone in many places to dirt track in some sections. Mountain bike, fat tire bike, cross bike and hybrid bike tires are best suited for this year’s trail ride. Road bike tires are not recommended. It is very important to have your bike tuned up by a bike mechanic before the ride to avoid mechanicals issues. You should bring a spare bike tube, tire levers and a frame mounted bike pump and know how to change out a flat tube if needed. Your bike tires should be in excellent condition with plenty of tread wear left. Bring a day bag, backpack or pannier for items you want to have during the ride like snacks, rain gear, sunscreen and spare bike tubes. Get excited! Here is the itinerary; to be updated as finalized. Optional ride to Goderich @ Lake Huron. Riders leave Blyth after breakfast and go into Goderich Beach area for reception and lunch. Riders return to Blyth for dinner and fireworks. Or just stay in Blyth for the day! Is your fitness level up to the challenge of a 4-day, long distance, off road trail ride? Are you comfortable with riding in the saddle for 8 hours of on/off pedaling? Are you ok with sleeping overnight in a tent for 3 nights? Is your bike equipped with 2 bottle holders or other suitable water supply? Would your physician approve you of this challenge? Are you aware and capable of the distance required to ride per day? Longest day 90km, total up to 280km in 4 days. Are you ready to have some fun while overcoming obstacles while on the trail? G2G wants to ensure you are fully prepared and qualified to be part of this epic Canada Rides G2G Event and looks forward to an experienced group of riders to build an awesome event in 2018. As more funds are raised, the trail will continue to be maintained and groomed in every section and the ride will become easier. We look forward to building the event year after year to facilitate more levels of cyclists. Mapping and wayfinding is an important tool for any trail. G2G has engaged with local stakeholders and the University of Waterloo, working together to provide active online mapping. Our mapping project is also being used to develop real time online tools for trail steward groups to aid in maintenance and project management. Our current map allows you to see not only the overview of the various communities and the entire trail, but also to find the major points of entry to the trail in Google Earth and the bypasses where bridges are yet to be rebuilt. When the final map is ready there will be a live link from the home page. Click on map to access Lake Huron Route from Goderich to Blyth via Auburn. Click on the map to access the Lake Huron Route from Blyth to McNaught Line , via Walton. Click on the map to access the Perth Harvest Pathway from Walton to Monkton. Click on the map to access the Perth Harvest Pathway from Livingston Line through the diversion at Milverton. Click on the map to access the Kissing Bridge Trailway from Millbank to Elmira, via Linwood and Wallenstein. Click on the map to access the Kissing Bridge Trailway from to Guelph via West Montrose and Ariss. The historic TC Trail coincides with the G2G at the Kissing Bridge Trailway. This newest Wellington County trail connects the G2G to the Elora Cataract Trail. This offshoot of the Blyth section travels along Blyth Brook and ends at a unique stone arch bridge. Fundraising campaigns can be tough to organize and the need for financial resources can seem never ending. In order to keep the legacy of the former rail bed in good repair, it was necessary to register the organization as a charity. This decision has been very well supported. 1. Ensure the G2G Rail Trail can be maintained for everyone to use. The G2G Rail Trail is proudly maintained by volunteers but is supported through your kindness and generosity. Your donations are greatly appreciated and can be made through our website using the Donate button, or by a cheque to our email address. If you have a specific project or purpose for your donated funds, please contact us directly via email – foundation@g2grailtrail.com. You can also help by using the trail yourself and spreading the word to get more people to use, enjoy and support the trail. Although time and labour is kindly donated by our volunteers, many of the materials and machines we need for the trail are not free. Improvements are varied and can be expensive, ranging from stone dust for the pathway itself to large bridges to reconnect the trail to its former continuous state. Past ventures include building bridges at Millbank, Blyth and Milverton, a staircase with bike trough at Katherine St. in West Montrose and improved surfacing, signage, kiosks and gates along the entire trailway. 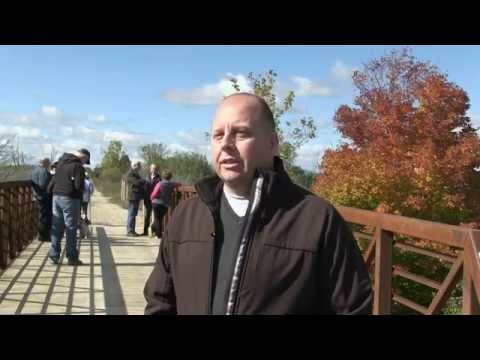 We look forward to building more bridges and adding benches and other amenities to make the Goderich to Guelph Rail Trail a safe and enjoyable passageway for you and your family. You can find more information about our past and ongoing fundraising projects by visiting our Donate page. 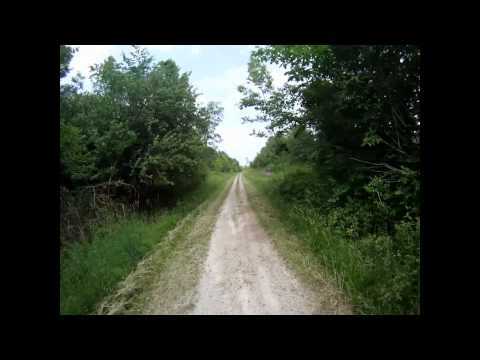 Goderich to Guelph Rail Trail Inc. strives to enrich the quality of life for everyone. We promote the development, preservation and enjoyment of diverse, high-quality trails and greenways that connect our Southwestern Ontario communities.